This MANDAU also known as �Parang Negara� from South Borneo, around Banjarmasin of the Aka Muslim people. It is a late 19 to early 20 C vintage with a 20 inches blade with curved cross section. 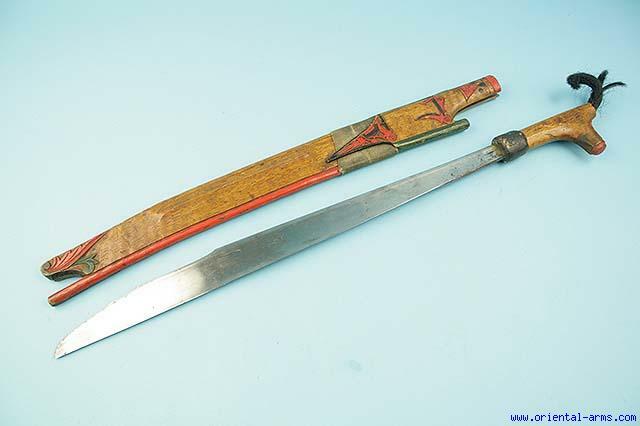 The blade is with brass star inserts along the entire length which indicate it was carried by a high ranking man. The handle is �L� shaped, carved from wood with tufts of black hair on the pommel tip. Carved wood scabbard painted black red and green. Total length 28 inch. Very good condition. An original authentic piece for real use.